Hello everyone. Just wanted to show you some cards I have just made. We will be making three of these in our May Card Classes. I'm not totally sure which three yet. When I start making cards I just can't stop!!! I'm sure my fellow cardmakers understand what I mean. We will definately be making the clock one & the little bike one & I haven't decided which one will be the third one, you will have to wait & see!!! As you can see this months theme I have gone with chipboard card accessories from 2 Crafty & lots of yummy flowers, ribbons & lace from Green Tara of course. 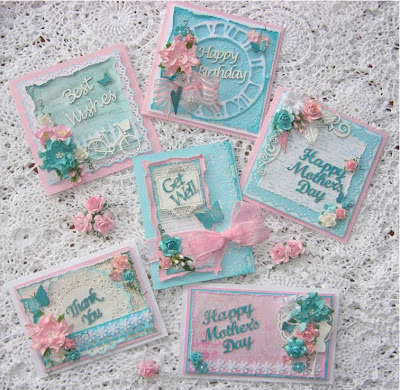 At our shop at The Entrance we have lots of really sweet little 2 Crafty chipboard pieces made especially for cards, including a good selection of little chipboard "card greetings" like the ones I have used here on these cards. They really do make cardmaking so easy. In our card class you will make 3 cards. Cost is $20 class fee plus $10 kit fee & learn a hole lot of new skills, but best of all, have fun while you are learning. Ring the shop on 43344451 or pop in to the shop to book in. Di, these are so, so pretty! I love the pink and green together, and there are so many lovely details. The little bike is the cutest!